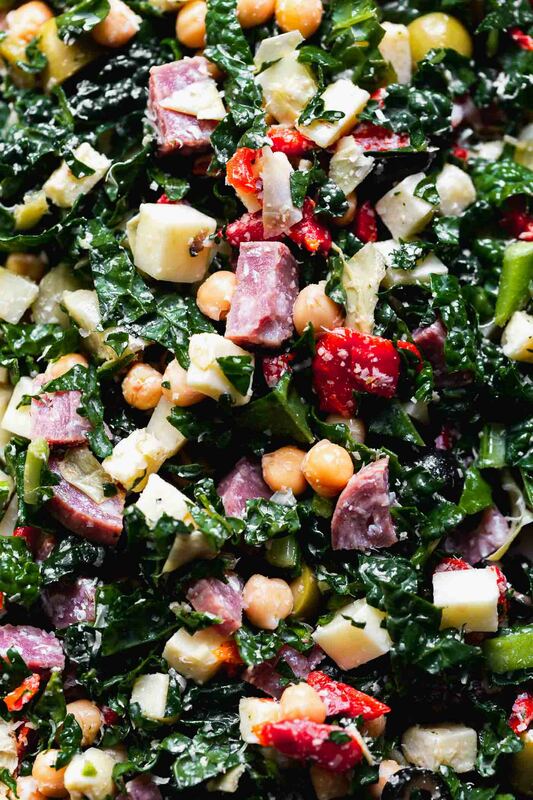 Easy Antipasto Kale Salad aka The only salad I want to eat from now until winter. 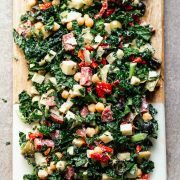 There’s really nothing not to love about this salad, because it’s everyone’s favorite happy hour food – a charcuterie board – transformed into a hearty kale side that’s impossible to resist. 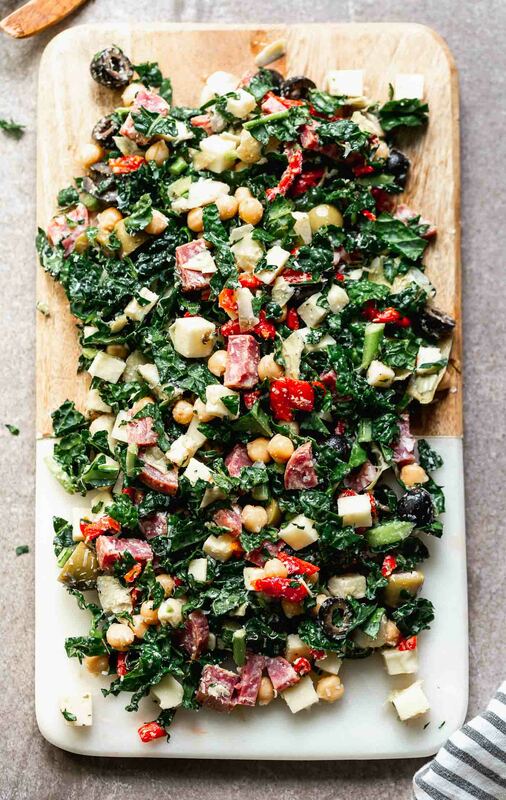 I mean, when I’m eating off a board, I always combine all my favorite elements into one bite, so why not throw it in a salad. Same concept, different vessel. 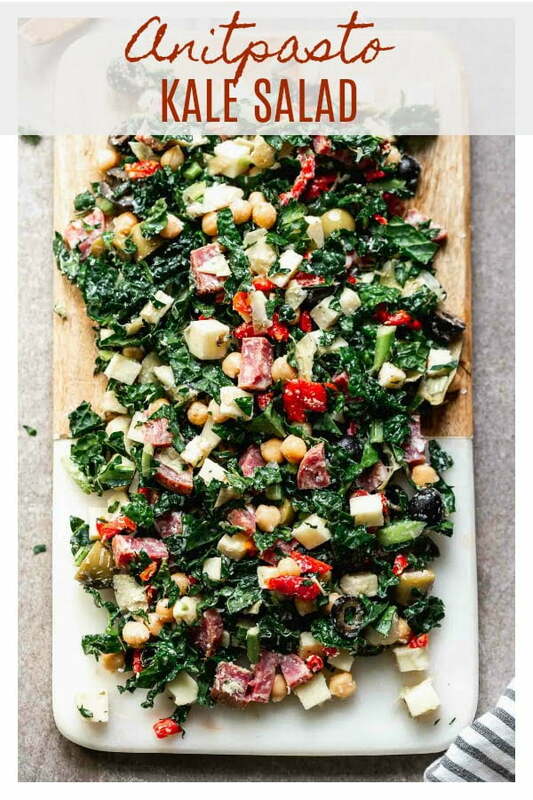 It’s definitely not an everyday salad like this one, since the ingredient list is infinitely longer, and I wouldn’t exactly classify it as a light side that would go with any entree. No, on the contrary, it stands perfectly well on its own for lunch or dinner. (Solidified by the fact that the inspiration for this came from a very similar charcuterie salad that’s on the lunch menu of a nearby restaurant.) 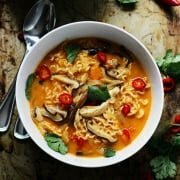 Although if you have a hearty appetite and are in the camp where salad does not a dinner make, then it would pair nicely with something a little bit lighter like this chicken noodle soup. 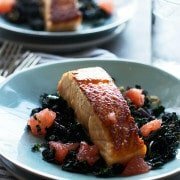 Or this salmon. Or this simple roast chicken. Obviously this isn’t an exactly science, these are just all my favorite go-to ingredients when it comes to a perfect charcuterie board. 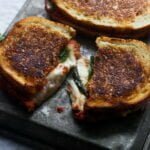 If you like prosciutto or mortadella instead of salami, you could absolutely substitute it out, or even better, add it in addition to the salami. Hate chickpeas, throw in white beans. If roasted red peppers aren’t your thing, pickled veggies or briny peppadew peppers would be delicious. Don’t like olives?? Skip them! I get it, kale isn’t everyone’s thing, so use Brussels sprouts or radicchio. And between all four of the (very different) cheeses I’m asking you to throw in, this is somewhat dairy-heavy, but again, this is how I prefer any antipasto or charcuterie board I put together. 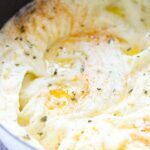 Because it’s super versatile, if there’s too much cheese for you, you can omit one MAYBE two, but I would stick with the sharper cheese and the grated parmesan since it’s an integral part of the dressing. 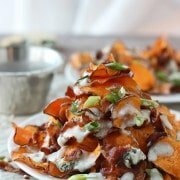 The best part, as stated in the recipe, is this is EASY. As in, can be prepped and on your table in 15 minutes. And if it weren’t for the chopping, this would literally be on the table in about five minutes. 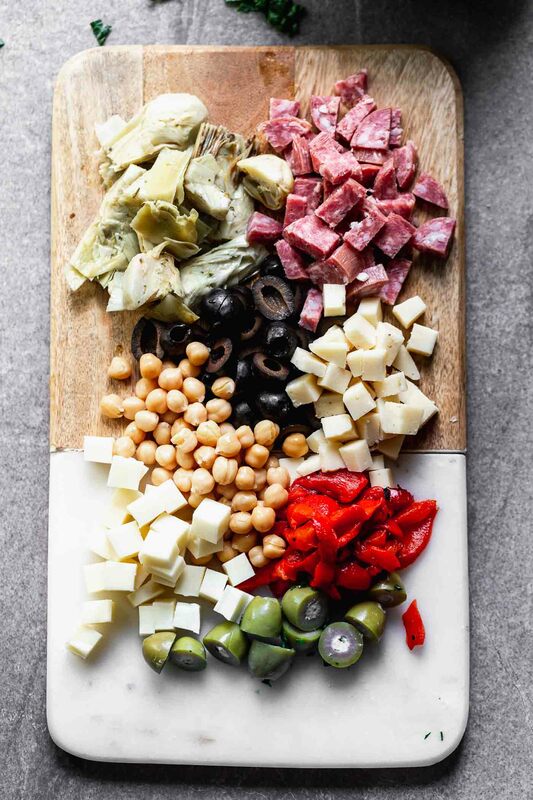 You can make things even easier, by purchasing pre-sliced black olives, artichokes and red peppers, and leaving only the salami, cheeses and green olives to chop. What to dress it with. The dressing, which is equally as simple is just a quick vinaigrette made with red wine vinegar, some freshly squeezed lemon juice, dijon mustard, olive oil and a little bit of salt and pepper for seasoning. I like to make it up in the bottom of the bowl or dish you want to serve the salad in, and then pile all of the ingredients on top. 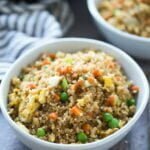 If you’re serving it right away, you can obviously toss everything together in the moment, but if you want to assemble and serve later, stack the ingredients on top of the dressing, cover with plastic wrap and then toss right before serving. It’s a little salad trick I learned somewhere along the way, and the only way I’m able to serve salad every single night for dinner – pre-prep! Pretty Things/Tools used in today’s post! Whisk red wine vinegar, lemon juice, dijon and parmesan in the bottom of a large serving bowl. Slowly whisk in olive oil. Whisk in salt. 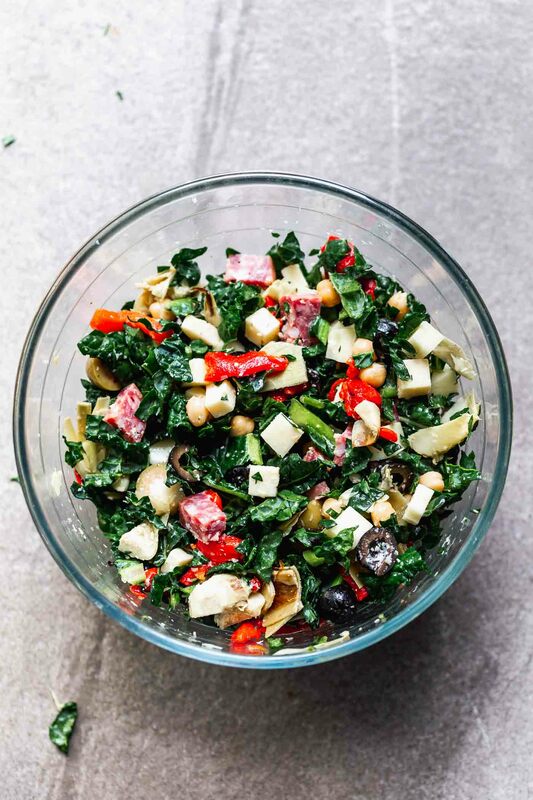 Place salami, red peppers, chickpeas, mozzarella, artichokes, Tuscan cheese, back olive, green olives and kale in the bowl. Toss together. Season with salt and pepper. Garnish with extra parmesan.